Debbie Mayes on neljän lapsen äiti. 33-vuotias nainen kertoo perheensä olleen aiemmin onneton ja kiinni oravanpyörässä. Perheenisä, 45-vuotias Gabriel Mayes, teki pitkiä päiviä useassa eri työpaikassa. Heillä oli iso talo, mutta liian vähän yhteistä aikaa. – Aloimme erkaantua toisistamme. Olimme onnetomia ja vailla yhteyttä, joten tajusimme, että meidän olisi tehtävä jotain elämämme muuttamiseksi, Debbie kertoo Metro-lehdelle. Lue myös Outo moka uutiskanavalla - Trump vähentää kehitysapua kolmelle Meksikolle? Pariskunta osti vanhan koulubussin ja he remontoivat siitä kuudessa kuukaudessa modernin asuntoauton. Nyt perhe matkustelee ympäri Yhdysvaltoja. Debbie kertoo lasten olevan ikionnellisia vapaudestaan. Hänen mukaansa elämästä on tullut yksinkertaisempaa, eivätkä he tarvitse ympärilleen materiaa onnellisuuden tueksi. I feel like Valentine’s Day can be such an awkward holiday for people…for every happy, loved up couple there is another who is broken and for every proposal story there is one still waiting to find their “one” ❤️ we’ve had many comments from people recently about how our love seems so perfect and I just wanted to say that no marriage is perfect, no relationship that doesn’t have disagreements…what makes a strong and happy marriage is the moments that you fight to stay, that you don’t quit. ❤️ so we celebrate love today…whether you’ve found it, are discovering it or holding onto hope that it’ll be in your future. may you all feel fully loved for who you are, whether that comes through a spouse, a parent or a friend! One of our most frequent questions is what we do about eating as a family and to be COMPLETELY honest, dinner has been a BIG struggle around here. 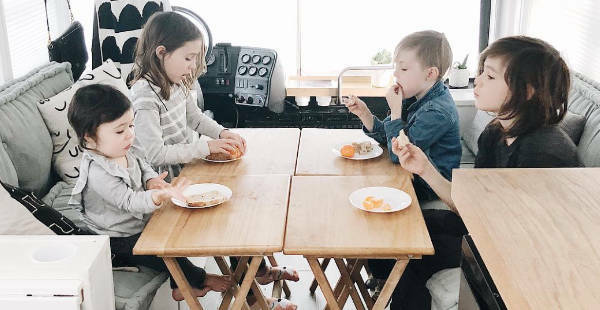  We originally had a fold down table that was a total fail so for right now these tray tables in the middle are what we're working with…when the weather is nice we eat outside at our picnic table. ☀️ If you look a few posts back you will see the tables folded up behind the drivers area. we get asked about the cleanliness of our bus allllll the time and the reality is…no, it’s not always clean BUT it only takes 15 mins to clean the whole thing! One of the big blessings of going tiny!  one of our biggest “tricks” is this drying rack we’ve had since day one…there is a spout on the side that drains the water right into the sink and once we are done with the dishes we put the whole thing inside of the sink. That’s where it usually sits in all the kitchen photos you see…because we have such a deep sink it hides in there perfectly!  I’ll be sharing more kitchen tips tomorrow! I used to be completely against anything other than square crop pictures but I’m realizing that it’s the only way I can show you more of our tiny home!!  when we first moved onto the bus we cut up memory foam for the kids odd-shaped bunk beds and it was definitely a temporary fix!  we found @custommattressfactory recently and discovered that they could easily (and pretty inexpensively) create any size of mattress that we needed!  you can check out more of the journey to putting the mattresses in over on our stories!